Yesterday I did a nice tour from Portland, driving up along the Columbia River to Astoria where the mighty river flows into the Pacific, then down the coast to Cannon Beach and finally back to PDX. All in all I was 14 hours on the road. The weather was very oregonic, starting with pouring rain along the river, turning to a sun / show mix on the coast and eventually finishing in a nice sunset. I will need to hit the digital darkroom over the next days to look through my images, but I’ll show you a first photo from the mouth of the Columbia River, where a mighty, 4.1 mile long bridge takes Route 101 across and connects Astoria in Oregon with Megler in Washington State. It opened in 1966. The south part has a 200 ft clearance so oceangoing ships can pass on their way to the upstream harbors of Portland and Vancouver. I took this long exposure image from the Cannery Pier just west of it. To smooth out the water and clouds I dialed in a 13 second shutter speed, closed aperture down to f/20 and used the lowest ISO of my PEN-F. To avoid overexposure I had attached my Haida ND3.0 neutral density filter, essentially a piece of darkened glass that reduces the amount of light hitting the sensor by 10 stops, the only way to achieve these long shutter speeds in bright daylight. The camera was mounted on a tripod and I used the Haida ND3.0 filter. I converted the RAW file to monochrome in Lightroom CC, using a monochrome preset as a starting point and then mainly adjusting the gradation curves. You will get to see more of this trip in the next days. Today will be all rain and I haven’t decided if I drive up to the Columbia Gorge to see the waterfalls. This is a great image Marcus. Well executed! Sehr cool, gerade in schwarz/weiß!!! That photograph is absolutely stunning! Beautiful! I’d love to share this image on my blog’s “Capture of the Day,” with your permission, of course. If you have a chance, cross over to the Washington side of the Gorge via the Bridge of the Gods and hike the trails at Coyote Wall and/or Beacon Rock. If you drive into the camping area of Beacon Rock (left side of Highway 14 heading east) you can park at the day use area and see some amazing falls, including “Pool of Winds.” You will need a Discovery Pass for Beacon Rock trails, but I believe there is a pay station at the trailhead. Coyote Wall is further east & on that side of Hood River, Oregon, you’re actually on the east side of the Cascade mountains, which means SUN. Enjoy! Gina, thanks, it means a lot, and of course you can share it 😊🙏! And thanks for the cool tips. Greetings from Multnomah Falls (a bit too touristic 😉). Was at Bridal Veil before, there was absolutely no one. Pics coming up…. Yeah, Multnomah Falls is unfortunately overrun. Very cool shot. I like the long exposure and BnW. Beautiful composition, look forward to more images from your trip. Thanks so much, Vanessa 😊🙏! Follow me @ rubyslens.wordpress.com please and see my pictures please and comment! Hey, Marcus did you like the photographs? Great photograph. I appreciate the technical details you provide, too. Thanks for the feedback, really appreciated! I always hope readers can take something from it. Ein Hoch auf den Oregoner Regenhimmel – und auf den Fotografen natürlich! So beautiful. My parents served a two year church mission there and they are dying to go back! I can imagine that they want to go back, it is such a beautiful area! Thanks for commenting 🙂 ! Thanks so much, glad you like it! 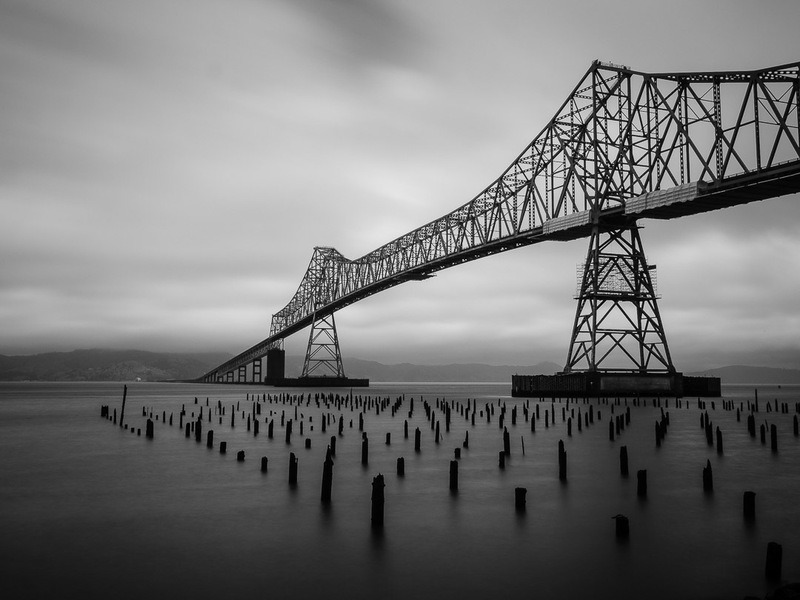 Great image, Astoria was one of my favourite places I visited in the USA. Driving over the bridge was amazing. Thanks 🙂 ! I imagine driving over was an experience. I spared it because it was pouring and it is a 9 mile round trip 😉 .